I didn’t know Craig Stanke well. I met him face to face in June 2011 when we had a CBSSports.com NFL get-together in Fort Lauderdale. The first night all of us (the writers, the bloggers and the editors) were in town, we ate dinner at a relatively expensive steakhouse, and afterward, Craig expressed disappointment, because – even though we had ordered plenty of alcohol, appetizers, steaks, seafood and dessert – the bill was too cheap for his CBS expense account. We should have ordered an extra side of shrimp or the creamed spinach a la carte or that fourth Maker’s and ginger. We were supposed to make it hurt, and we had failed. The truth is, Stanke, who died in his sleep Monday night at the age of 56, seemed to love newspapers but he also seemed to have lost his lust for them. Like I said, I didn’t know him all that well,* but he was a guy who worked at south Florida newspapers before turning to the internet in 1997, where he eventually became the deputy managing editor at CBSSports.com. Basically, he was the guy who ran the day-to-day operations of the outfit. You had a story to pitch? You went to Stanke. You had a problem? You went to Stanke. *To read an excellent column by one of his best friends, the L.A. Times’ T.J. Simers, click here, and this one from CBSSports.com’s Scott Miller is a standout as well. Craig and I were Facebook friends – it was through social media, really, that I got a sense of his wit and his love affair with running – and as his discontent with the South Florida Sun Sentinel grew, it seemed that his status updates regarding his hometown paper turned desperate. Eventually, he cancelled his subscription, and although the decision, I suppose, was inevitable, he seemed saddened by it. He was a newspaper guy living through the demise of his hometown rag. He had a great job in journalism’s present and was preparing hard for the future, but he also seemed disappointed that the newspaper era in which he had toiled for two decades was on the road to irrelevance. Especially since he had made such an impact in newsprint. Not just in the south, mind you, but in the north and the west. From his LinkedIn page, this is was his career. 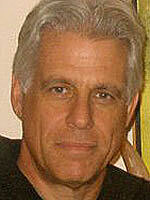 His last job was at CBSSports.com, but suffice to say, he was a newspaper guy through and through. Which is the attitude he took when he interacted with his writers. He also helped get me into Super Bowl XLV. Originally, only two of the three Eye on Football bloggers were supposed to have seats in the auxiliary press box. I lost the lottery, meaning I would write from Dallas all Super Bowl week but I wouldn’t be in attendance at Cowboys Stadium. Until Stanke stepped in at the last minute and finagled for me a pass to the media workroom next to the field. I had to watch the game on TV, but I still was a part of the live coverage team (and truthfully, I sneaked into a sweet pregame party on field level that my brethren in the press box didn’t know about. I toasted my freshly-cut prime rib to Stanke that night). Anyway, when he called to tell me the good news, I asked him where the media center was, and he said in kind of an exasperated way, “I don’t know, Josh. But I got you into the stadium.” Indeed he did, and I appreciated it. I guess I never really told him that. About a year ago, I wrote a piece for the website in which an NFL quarterback from the 1970s let loose a, “F— Drew Brees” comment. I wrote it – led with that quote, actually – and the day it appeared, the former QB called me. He was pissed, and he let me know about it. After spending 30 minutes on the phone with the QB, I dialed Stanke to give him the heads up that I had been called. Even though I was bugging him at home, Stanke took 10 minutes to let me know that everything was cool and that he stood with me behind that story and the way it had been presented. I figured that story and that quote would blow over in a few days, and it did. And even though I wasn’t upset that the QB was upset at me, it was nice to hear Stanke’s voice of reassurance. For a newspaper guy, he took to online journalism quite well. He landed a high-level job at one of the most prestigious national sites around, and he did something inventive with Twitter, where he used his account to tweet out the daily CBSSports.com story budget. His nearly 1,300 followers got details every day about who was writing what and when it would be online. The point, I think, was so that the viewer could sit in virtually on the budget meetings, so that readers could go behind the scenes for a brief moment. This wasn’t the thought process of most newspaper guys, but like a buddy of mine said, Stanke was the kind of editor who could bridge the gap between the dead tree days and what it means to be an online journalist today. Stanke’s twitter account was great, and that’s the kind of stuff that makes the internet great (I mean, Twitter and the Internet. Wrong style. Sorry, Stanke). Craig understood that. The last 24 hours have been a time of sadness, and though I didn’t know him well, reading his Facebook page and his Twitter mentions shows that his impact on journalism and on the world in general was something to behold. I was excited to see him next week at this year’s NFL summit for us at CBSSports.com. I was ready to help make that dinner bill extravagantly expensive. Now, we’ll have to do it to honor for Stanke – the runner, the online adapter, the editor, the man who was loved by many and respected by even more. 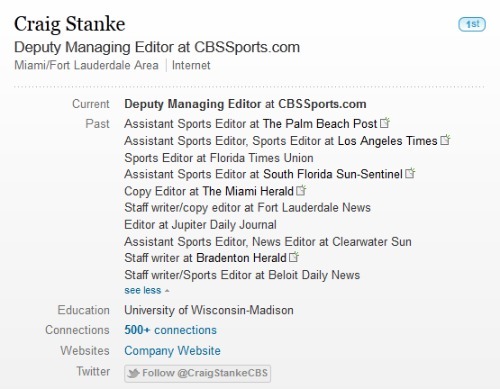 Here’s hoping the Sun Sentinel runs a big obituary on Stanke in the newspaper on Tuesday, a 20-inch black and white eulogy with maybe a mug shot of Craig’s grinning face. One last toast to the man who left newspapers behind. I imagine he would have enjoyed that. This entry was posted in Non-sports and tagged CBSSports.com, Craig Stanke. Bookmark the permalink. Good story, Josh. It’s sad to lose all these great pillars of journalism from a bygone era, but dang if you don’t do a good job of eulogizing them … even if you don’t know them all that well. I think I might put in my will that you will write my obit.